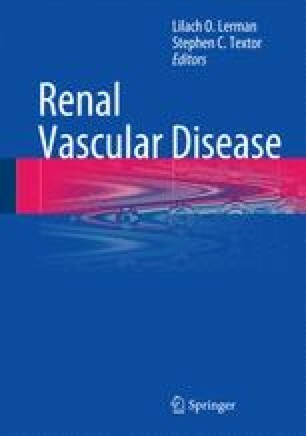 Unilateral renal artery stenosis causes angiotensin II-dependent hypertension and leads to injury of the stenosed ipsilateral, as well as the non-stenosed contralateral kidney. While the hypertension is triggered by hypoperfusion-dependent renin release of the stenotic kidney, dysfunction of the contralateral kidney is what permits the blood pressure to remain elevated, and may even be the driving force behind the hypertension in the late stages. The differential function and crosstalk between the two kidneys are determined by the interaction among several neurohormonal pathways. Understanding the simultaneous processes taking place in both the ipsilateral and the contralateral kidneys should provide a better insight not only on the hypertensive process, but also on the mechanisms to progressive renal injury in this condition.